The validity of a contract can be undermined by factors affecting contractual consent. Issues of contractual validity frequently arise for consideration in all types of litigation, not least commercial disputes. This book provides practitioners and academics with an invaluable reference tool, which will enable them to navigate the complex issues of vitiation of contract. When contractual disputes arise, there are a variety of vitiating factors which may be relied on to undermine a contract’s validity. 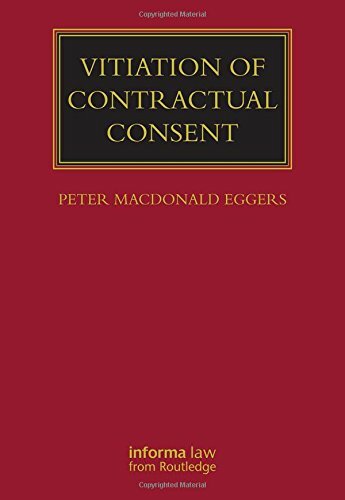 This book provides a comprehensive examination of all the factors vitiating contractual consent from fraud, misrepresentation, non-disclosure, and mistake, to duress, undue influence, unconscionable bargains, and includes chapters on incapacity and unfairness. Each chapter gives a thorough account of the law on each of these vitiating factors, together with an overview of the remedies available. The book’s introduction considers the theoretical foundations of the law in this area. The book will be an invaluable reference tool for lawyers involved in all types of contractual disputes. It will also be a useful reference for academics and postgraduate students of commercial law. Peter MacDonald Eggers QC is an established and highly respected silk at 7KBW. He regularly appears before the Commercial Court and the Court of Appeal and in commercial and international arbitrations. He has published widely and is a Visiting Professor at University College London.